Join the conference to learn and to share your expertise on the current landscape and future roadmap of the emerging world of human ­centric personal data management. While there are certain countries with more active MyData movements than others, they are all inspired by initiatives from around the world. MyData teams in Finland, Estonia, and France are collaborating with others globally to make this system work. MyData is both an alternative vision and guiding technical principles for how we, as individuals, can have more control over the data trails we leave behind us in our everyday actions. To do this, we are developing a standardised, open, and mediated approach to personal data management by creating “MyData operators”. The MyData operator account would act like an email account for your different data streams. Like email, different parties can host an operator account, with different sets of functionalities. Some MyData operators could also provide personal data storage solutions, others could perform data analytics or work as identity provider. The one requirement for a MyData operator is that it lets individual receive and send data streams according to one interoperable set of standards. This “MyData” model does a few things that the current data ecosystem does not. It would let you consent to the secondary use of your data. For example, you could take data collected about your purchasing habits by a loyalty card to your favorite grocery store and use it in a personal financial management system to see how you are spending your money on groceries. It would also let you see and change how you consent to your data being used over time. As things stand we have complicated terms of service agreements where we just check yes or no one time, without being entirely sure what we are agreeing to. It would also let you take your data from one place to another if you decide to change services. Right now, the technical solutions exist to let your manage your data according to a MyData approach. 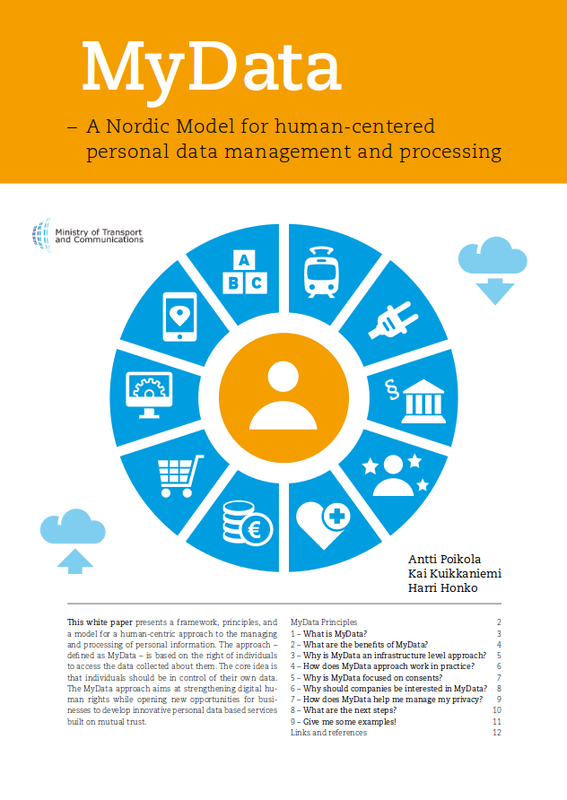 There are many other initiatives, emerging out of both the public and private sectors around the world, paving the way for human-centered personal data management. We believe strongly in the need to collaborate with other initiatives in order to develop an infrastructure in a way that works with all the complicated systems at work in the current data landscape. We’re working with a wide and diverse group of partners to make this work, and to make it right. We are in the midst of developing this technology, piloting it in cooperation with local businesses, and fostering the creation of similar platforms. 1 – What is MyData? 2 – What are the benefits of MyData? 3 – Why is MyData an infrastructure level approach? 4 – How does MyData approach work in practice? 5 – Why is MyData focused on consents? 6 – Why should companies be interested in MyData? 7 – How does MyData help me manage my privacy? 8 – What are the next steps? 9 – Give me some examples!